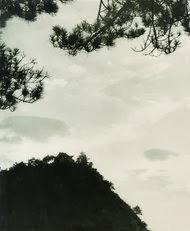 This is a photograph taken by Mao Zedong’s fourth wife, Jiang Qing, and sold just recently for $64,000. Entitled ”Fairy Cave on Lushan Mountain,” it was taken in 1961 during a trip that Mao and his wife took to Lushan, a mountainous region in the southeastern Chinese province of Jiangxi. Regardless of who took it, or where it came from, I find it quite extraordinary. It makes one wonder about education in the end, because I don't think that a school can teach 'art': Its a gift located in that space separating a human being with the Natural world which encloses each of us here on earth. It can arrive at any moment, to anyone, and isn't that what makes it all so interesting?